All sandwiches and salads can be made into wraps. Sandwiches - All sandwiches are on our homemade bread. Paninis - Panini is an Italian inspiration on hearty bread with fresh ingredients, pressed on a grill and served warm. Meats - We slice our own turkey, corned beef, ham & roast beef. ​Breads - White, wheat, marble rye, sweet rye. 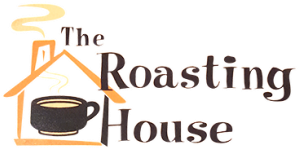 Served with fresh fruit, kettle chips or cup of soup. 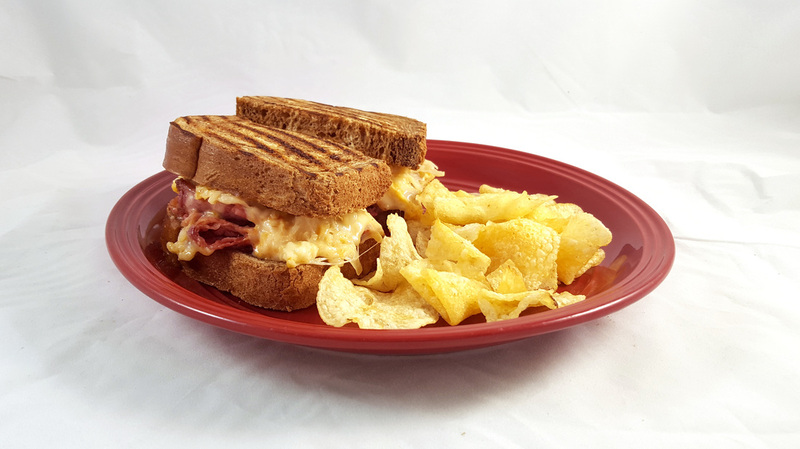 An American classic, marble rye bread, corned beef, sauerkraut, swiss cheese, and thousand island dressing. Or try a Rachel made with turkey. Cucumbers, onions, red, yellow and orange peppers, banana peppers, mushrooms, provolone cheese, veggie cream cheese on homemade bread. Avocado, peppers, red onion, shredded carrots, mushrooms, cucumber, and hummus or pesto, served on sweet rye. Smoked turkey, monterey jack, bacon and dill pickle slices with smokey mustard on your choice of bread. Roast beef, cheddar cheese and mushrooms, with garlic horseradish sauce on choice of bread. Turkey, cranberry sauce, cream cheese, swiss cheese, sunflower nuts, romaine lettuce on choice of bread or croissant. Grilled chicken, ham, mustard & swiss cheese on your choice of bread. Turkey, cream cheese, Minnestalgia Blueberry pepper jam, swiss cheese, sunflower nuts, romaine lettuce on wild rice bread. Seasoned chicken, pesto sauce, bacon and provolone cheese on homemade bread. Triple-stacked toasted with ham, turkey bacon, cheese, lettuce, tomato and mayo. Grilled peppered citrus salmon filets on a croissant with lettuce & tomato. Or try it as a wrap! Served with mango salsa. Diced chicken, celery, slivered almonds, pineapple, grapes and creamy dressing on your choice of bread or croissant. Grilled chicken, shredded cheddar, corn & black beans. Served with sour cream and salsa. Grilled chicken with parmesan cheese, lettuce, tomato, and ranch dressing wrapped in a garlic herb tortilla. Or try our LOW CALORIE VERSION! 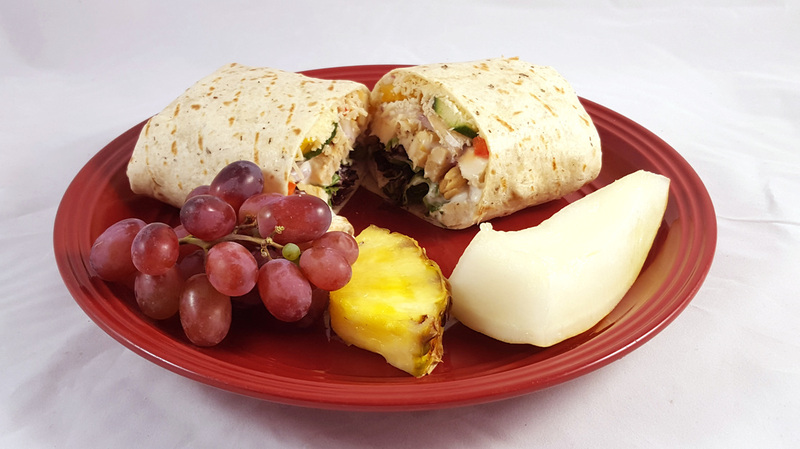 Grilled chicken, mix of peppers and onions, lettuce, tomato, cheddar cheese, and southwest dressing wrapped in a garlic herb tortilla. Ham, turkey, bacon, lettuce, tomato, cheese, and ranch dressing wrapped in a garlic herb tortilla. Grilled chicken, mixed greens, peppers, cucumbers, mushrooms, cashews with ranch dressing and parmesan cheese. Or try with our raspberry vinaigrette dressing. Season grilled chicken, lettuce, pepper jack cheese with spicy buffalo sauce and a side of blue cheese dressing. Seasoned cajun grilled chicken, mango salsa, pepperjack cheese, lettuce and tomato on a garlic herb tortilla or homemade bread. Turkey, bacon, avocado, ranch dressing, lettuce, tomato on a garlic herb tortilla. Grilled chicken breast, pepperjack cheese, ranch dressing, bacon, lettuce & tomato. ​Turkey, bacon, ranch dressing, monterey jack cheese, grilled on a croissant. Mixed greens, diced chicken, red onions, mushrooms, mixed peppers, cucumbers, parmesan cheese, and cashews with your choice of dressing. Grilled chicken, romaine, asian slaw, wonton strips, mandarin oranges, red peppers, red onions, cucumbers, parmesan cheese, low fat sesame ginger dressing. Try it on a wrap, also! Seasoned chicken, tomatoes, mixed greens, cheddar cheese, red onions, and salsa. Served with salsa, nacho chips and sour cream. Chicken, spinach greens, mixed peppers, parmesan cheese, red onions and craisins, with a choice of dressing. Try it on a wrap, also! ​Served with Goldfish crackers and apple sauce or fresh fruit.